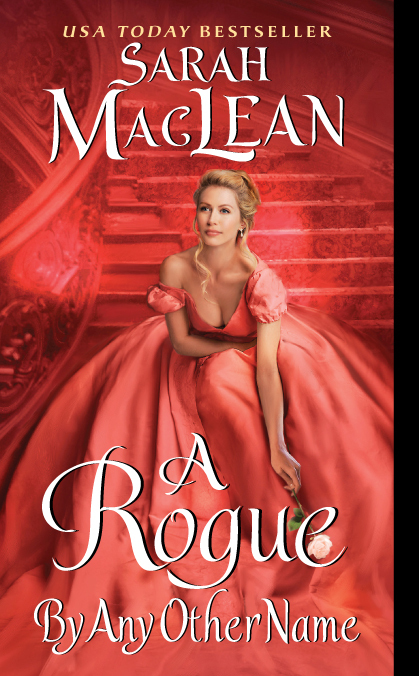 I chose to read A Rogue by Any Other Name because I’m working my way through RITA’s 2013 Contest winners and Sarah MacLean’s book won best Historical Romance. I have a hidden weakness for historical romances and I’ll admit I’m kind of a Jane Austen freak. During this past summer I’ve read my fair share of dashing rogues and soon to be spinsters but for some reason, A Rogue By Any Other Name, never crossed my “To-Read” list until I decided to check out the the current RITA winners. And boy am I glad I did. This book is your typical historical romance with mothers having fainting spells trying to marry off their unwilling daughters and horny gentlemen trying to sew their wild oats before taking a proper boring wife but wait there’s more! This book also has utter ruination but instead it’s the man’s reputation, not the woman’s. There is also kidnapping, gambling, wicked pleasures and a group of rogues that no one wants to mess with. All in all, it’s a great read for those who love that kind of book and a good read for those who don’t. Why you ask? Because the heroine of the story, though still governed by society’s rule, decides she could care less and breaks out of the mold to capture what her heart desires. And that, my friend, is a hit with any woman, whether she is a fan of Contemporary Romance or Historical. I gave this book 4 stars because (1) I enjoyed it and read it in one day (2) I liked the twist of Penelope breaking out of the box and doing what she wants instead of being a boring ole housewife and (3) I’m eager to read on to the next book in the series. That’s right, this book is #1 in a series titled The Rules of Scoundrels. Book #2 is One Good Earl Deserves a Lover and book #3 is No Good Duke Goes Unpunished. I have to admit, after reading the ending of Book #1, I can’t wait to see what kind of crazy mess Pippa and Cross get into and I’m intrigued to find out just how far Penelope pushes the constraints of London society. Would I recommend A Rogue By Any Other Name to someone else? Yes. It’s a fun, easy read that captures your emotions and leaves your wondering what happens next. This entry was posted in Book Reviews and tagged 2013 RITA Winner, A Rogue By Any Other Name, Amazon, Book Review, Darla G. Denton, Historical romance, Kindle, Sarah MacLean. Bookmark the permalink. I also enjoyed this one. The second one was a bit more difficult for me, but I won’t reveal why because I don’t want to spoil it for you. I’d be interested to see your take on the second book in the series. I haven’t read the third. I’m trying to avoid Regencies…I don’t want to influence what I write. Ooh, you’ve got me intrigued! Lol i wonder what happens next?? I have that fear as well (reading books similar to what I’m writing) … So while writing my book I try to go for anything other than Contemporary or Curvy Romances. Jennifer Crusie was our instructor in the McDaniel Romance Writing program. I’ve read a few of her books, but not many, so I’ve started working my way through them. I love her snark!